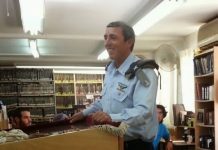 The IDF deserter who was recently jailed after being caught in Eilat is visiting rabbonim for chizuk. Today, Moshe Chazan visited Rav Dovid Solovetichik, Rosh Yeshivas Brisk in Yerushalayim, hours after being released from military prison. 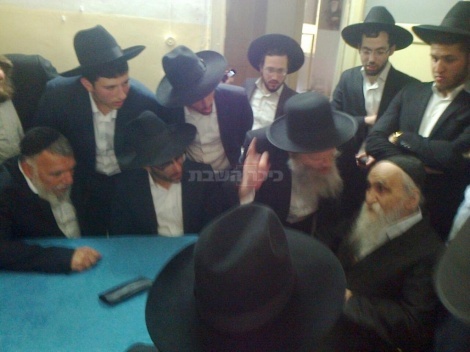 Chazan also visited Rav Shmuel Auerbach, rosh yeshiva of Yeshiva Maalos Hatorah, and Rav Yitzchok Tuvia Weiss, gaon av bais din of the Eidah Hachareidis. Chazan was accompanied to Rav Soloveitchik by Rav Shlomo Zalman Brand, who told the rosh yeshiva about the boy’s arrest and his stay in prison. Rav Brand said that the boy is a talmid at Yeshiva Shaarei Tevunah, whose students do not visit the IDF recruitment offices. 1. Why are you making hero out of this bachur? I, Stanley Koop, fully support the Rabbi shlita’s position. I offer a free ticket out of Israel to any place on earth to the Rabbi shlita, his family, and anyone in his yeshiva with one condition: They agree not to return to Eretz Yisrael. Please contact me directly and I will make it happen. Do you think that the Leftist Generals who sympathize with the Palestinians are heroes? Perhaps you like Netanyahu and Yaalon who prosecute the one who shot the Palestinian who looked like he was wearing a suicide belt? Off these Jew haters a ticket out of the country rather than those that are moser nefesh for Torah and protect Israel in the merit of their learning. you see daas Torah affirms that the Zionists only want to take learners from the beis medrash. So tell me does the torah allow people to leave Israel for luxury reasons? stanley koop is not embarrassed to assign his name to a statement that shows his great sinas hashem and his torah where rashi tells us that a tzaddik in a place whoo zeevah whoo hadarah whoo hodah in parshas vayetze this clown wants that the tzaddik should davka not be in eretetz hakodesh. This bochur is a hero #100. A yeshiva bochur belongs in yeshiva period. Torah is always growing. Yireh now. WHat does all this have to do with solving the shidduch crisis. I see censorship and “correctness” is alive and well at Matzav.com. I posted a comment yesterday, but it was not allowed. Too bad. I know it’s assur d’oraisa to point out that the chareidi community enjoys protection from the IDF (as Hashem’s shliach). I guess there’s only one way to think and everybody who does not join lock-step in the “correct” way of thinking just does not belong here.